The school board is expected August 9 to approve the selection of three new administrators. Anna Wilcek will serve as the principal for Andersen Elementary School, Gina Doe will serve as assistant principal at Stillwater Middle, and Caitlyn Willis will take over as the assistant director of Student Support Services. Read more. About 230 students from across the district took a break from summer relaxing and headed back to school. Students entering grades 1-6 took part in Summer Success at Andersen Elementary. The three week program is designed to give students the opportunity to catch up to classmates and better prepare them for the coming year. 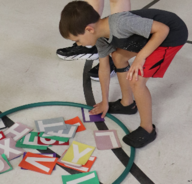 This year, Summer Success not only taught students new skills, but kept them engaged through cross-curricular lessons that combined physical education with spelling and reading with geometry. Read more. Information about your child's bus route will no longer be coming to you by mail. Instead, you'll be able to access this information electronically - several days earlier than it has been available in years past. An email will be sent to families the week of August 13 that will include a website link, username and password for the Versatrans e-Link system. Please make sure to have an accurate email address entered in Skyward. You can update your email here. Using the Versatrans e-Link system should result in families receiving their bus information nearly a week earlier than it has been previously available, in addition to reducing printing and postage costs. Would you like to help students to become successful in reading or math? You can make a difference by serving with the Minnesota Reading Corps and Minnesota Math Corps! No experience is necessary – tutors receive training and ongoing coaching throughout the year. Tutors are paid a living allowance every two weeks and are eligible for up to $5,920 for tuition or repayment of student loans. Tutors 55 and older may gift the education award to a child or grandchild. Free health insurance and child care assistance is available for qualified applicants. Learn more. Community Education has even more activities planned for this fall! 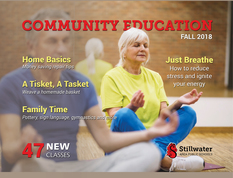 There are 47 new classes for adults to choose from, including personal training, basket weaving, job search advice, and more! Look for the catalog in your mailbox next week or view it now online. You can register for classes starting Monday, August 6. Four school board seats will be up for election on the November 6, 2018 ballot. Anyone interested in running for School Board must file an affidavit for candidacy between Tuesday, July 31 and Tuesday, August 14. Filing takes place at the school district’s Central Services office, 1875 South Greeley St, Stillwater. Interested candidates should plan to attend a special information and training session on Thursday, August 9 at 5 p.m. at the district's Central Services Building where important information about serving on the school board will be shared by leaders from the Minnesota School Boards Association.